MEMORY FOAM is a high-density latex foam, a material that changes in relation to body heat, molding perfectly to what it compresses and returns to its initial shape after compression is eliminated. 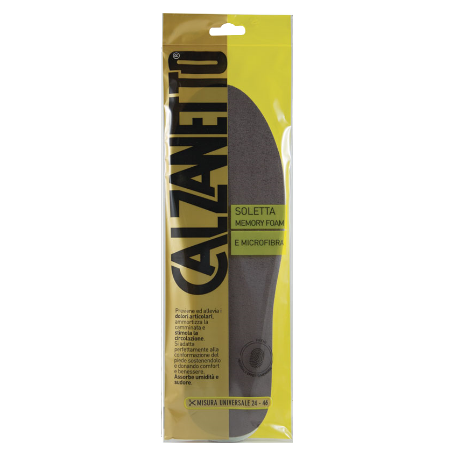 For this principle, the Calzanetto in Memory Foam sole fits perfectly to the shape of the foot, supporting it naturally each time you wear it. During walking stimulates circulation and relieves pressure due to body weight, thus reducing joint shocks. To make this pad even more comfortable, the Memory Foam Calzanetto has added a layer of MICROFIBRA to wear to the foot, which, in addition to being touchy, has the property of absorbing sweat. Thanks to the "open cell" conformation, both the latex foam and the microfiber leave the foot well breathable. It absorbs moisture and sweat. Ideal for those who are always on the move, or spend many hours standing or just for those who want to give up on comfort and convenience. Print with non-toxic inks, without heavy metals. Universal measurement from 24 to 46. Cut out the insoles to the desired size by following the printed broken line. Place them inside the shoe in such a way that the fabric side is in contact with the foot. Thanks to the presence of latex, during the walk the Calzanetto Memory Foam soliment stimulates circulation and relieves pressure due to body weight, thus reducing joint shocks.